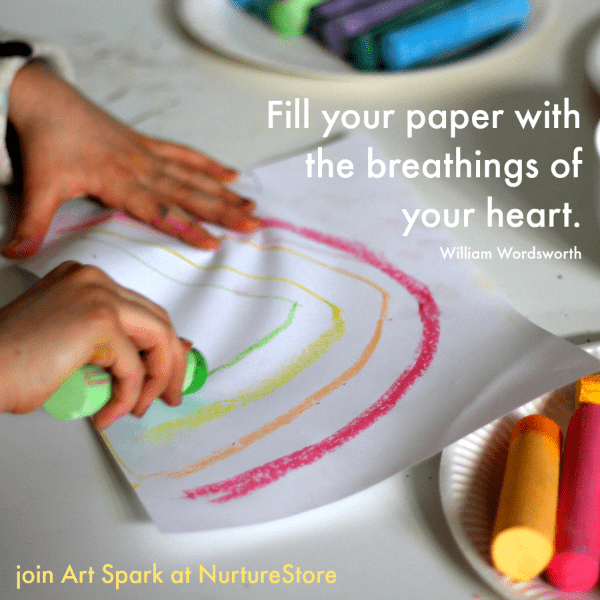 In this extract from my new book Nurture Art we’re looking at how to find inspiration for art projects, with ideas for art projects you can try with your children throughout the year, seasonal art projects, art ideas inspired by nature, and suggestions for ways to integrate art across the school curriculum. 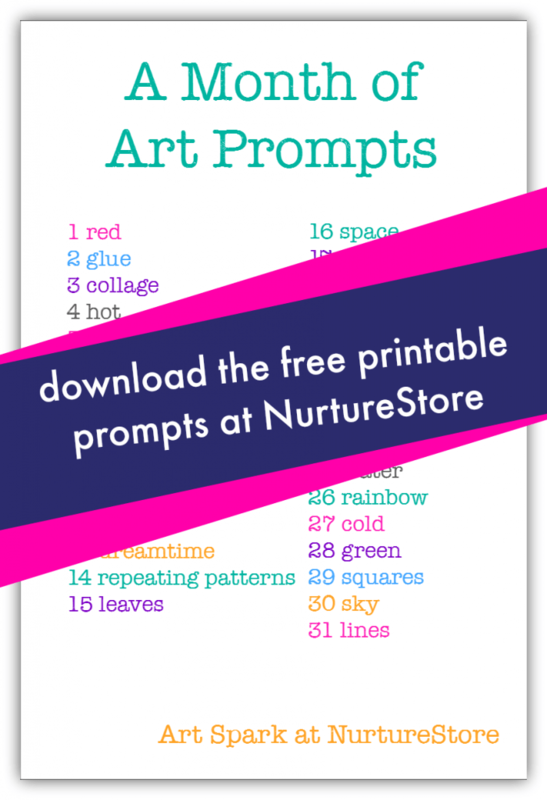 There’s a free printable poster with a month of art prompts too. :: join an art challenge on Instagram. These typically have a daily prompt for a new sketch or art idea. Or use the month-of-art prompts which you can find at the end of this book. In science you might try a watercolor study of the flowers you are learning about in biology. In history you might draw out a map of the Celtic village you are studying. In literacy you might sketch along to the story you are reading. In math try creating Islamic-inspired patterns from cut-out colored paper, to accompany your study of symmetry and tessellation. 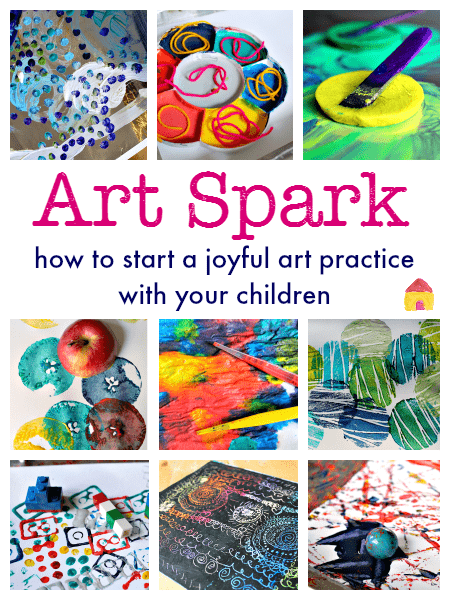 The Art Spark resources bring you 30 art projects that make it easy for you to explore creative techniques with your children and give them benefits of process art . There are lots of ideas that are very easy to set up, so whenever you want to do some art you’re all ready to go. 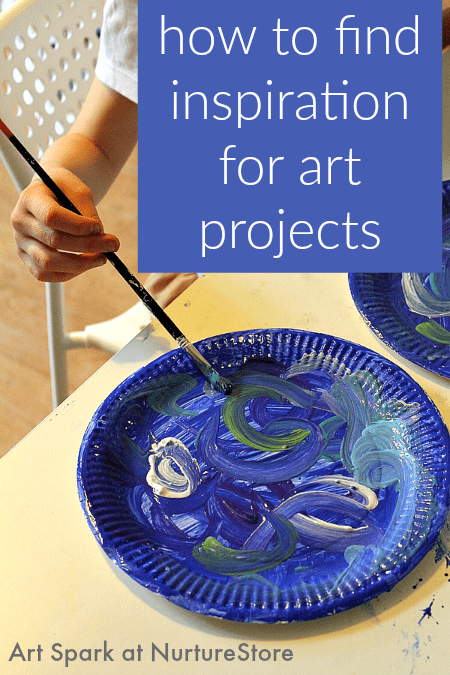 The projects including watercolours, mono printing, marbling, scrape painting, drip painting, frozen art, scratch art, printing techniques, yarn art, and ideas to explore shape, color, gravity and movement. Also included are links to famous artists, well-known works, and art around the world, so you can go deeper into arts education including: Henri Matisse; Rex Ray; Pablo Picasso; Janet Sobel; Georgia O’Keefe; Paul Cezanne; Yves Klein; Guiseppe Arcimboldo; Jackson Pollock; Cy Twombly; Alberto Giacometti; Harry Bartoia; Lescaux, Altamira, and Ubirr cave and rock paintings; Japanese suminagashi; and Mexican Huichol art. Click here to see the online art resources. :: as a poster to put on display in your art studio, classroom, kitchen or playroom, perhaps for rainy days, when children finish another activity early or they’re waiting for dinner to be served!